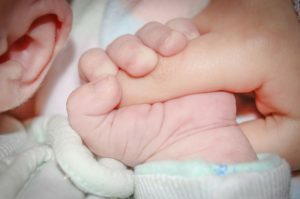 The Journal of Addiction Medicine suggests that the cost of treatment for babies born with Neonatal Abstinence Syndrome (NAS) has increased dramatically . NAS is when a baby is born with opioids in their system and they are suffering from complications due to withdrawal of opioids [1, 2]. In an analysis between 2008-2011, 160 opioid exposed newborns were identified. 95 infants identified were exposed to opioid agonist drugs, or those used to help reduce the effects of NAS while the mother is in substance abuse treatment prior to birth. The remaining infants were found to be exposed to varying short acting prescription opioids taken illicitly by the mother . Babies in this analysis were hospitalized on average for 23 days, compared to the typical 1-2 days post birth for a health newborn . Also in this study, costs of treatment rose from $1.1 million in the first year, to $1.5 million in the second year, and $1.8 million in the third year. These costs were shown to be 15-16 times higher than that of healthy infants . In another study to look at the extent, context, and costs of NAS found that the rate of NAS is continually rising in the United States. From 2000 to 2012, there was an estimated 21, 732 infants born with NAS, equally 1 baby born with NAS every 25 minutes . A majority of the costs for treating NAS is paid for by state Medicaid programs, possibly indicating the greater tendency of opiate abusing mothers to be from lower income families. The cost of a baby being born with NAS averages $66,700 compared to $3,500 cost for healthy newborns . NAS occurs when the baby is immediately cutoff at birth from opioids and other drugs. NAS can cause tremors, vomiting, and other withdrawal symptoms as well as heightens the risk of health complications. It is characterized by gastrointestinal, respiratory, autonomic, and central nervous system disturbances from opioid withdrawal that affect critical regulatory areas of postnatal life adaptation . More recent studies have revealed that in-utero exposure to nicotine, SSRI (antidepressants), and benzodiazepines may also influence NAS . Withdrawal symptoms most commonly occur 48-72 hours after birth and include tremors, hyperactive reflexes, seizures, excessive or high-pitched crying, irritability, yawning, stuffy nose, sneezing, sleep disturbances, poor feeding and/or sucking, vomiting, loose stools, dehydration, poor weight gain, increased sweating, temperature instability, and fever . The Cost of Neonatal Abstinence on Healthcare is paid for by Medicaid 60% of the time [6, 7]. Medical treatments for NAS typically cost $150,000 per child, and in 2015 the average overall cost for a newborn suffering from NAS was found to be between $159,000 and $238,000 . The 2016 bipartisan budget law increased funding to address the opioid epidemic to $400 million, and President Obama called for $1.1 billion in new funding to address the opioid epidemic by supporting prevention, treatment, and recovery services. This funding will expand evidence-based treatment programs for opioid use . CDC examined state trends in NAS incidence using all-payer, hospital inpatient delivery discharges compiled in the State Inpatient Databases of the Healthcare Cost and Utilization Project (HCUP) during 1999–2013. Among 28 states with publicly available data in HCUP during 1999–2013, the overall NAS incidence increased 300%, from 1.5 per 1,000 hospital births in 1999, to 6.0 per 1,000 hospital births in 2013. During the study period, significant increases in NAS incidence occurred in 25 of 27 states . According to the Joint Commission’s, Division of Healthcare Improvement, practice guidelines can help reduce the effects of NAS and reduce the length of stay for infants, therefore lowering healthcare costs. It recommends maternal-dyad care is significantly more beneficial that treatment the infant along. It suggests mothers be educated regarding addiction, breastfeeding support, ongoing assessment of mother’s parental readiness, rooming-in options, and integration of the mother to newborns care plan . The ultimate goal of NAS treatment is to stop showing signs of withdrawal, feeding and sleeping well, weight gain, and to maintain stable withdrawal scores with little, if no support. Following NAS guidelines can help reduce the length of stay and effects of NAS on the infant. The guidelines are to identify maternal drug use through review of records for prescription or illicit drug use, positive drug screens and/or risky behavior; initiating the Finnegan Scoring System within 24 hours of admission and assessing every 3-4 hours following. Placing the newborn in a dark, quiet room with minimal disruption, sleep protection and pacifier use. Encouraging self-calming efforts, skin-to-skin contact, and individualized caregiving. Meeting nutrition needs with on-demand feeding and avoid unnecessary waking. Dressing newborns in one short with loose swaddling, appropriate skin care and protective barrier cream. Education with parents while in hospital about NAS and comfort strategies with positive reinforcement and determining when the medical team needs to make pharmacological decisions . Also shown to reduce cost and length of stay in hospital, is combining both inpatient and outpatient care in treatment programs. In conclusion, the costs of NAS on the Medicaid health care system are overwhelming. Through various research and analysis, education and awareness early on can help reduce the rate of NAS, as well as the effects and length of stay in hospital to newborns with NAS. What surprises you about NAS? Why do you think the costs are so high?